Walking may seem like a simple activity and really, it should be. But with so much time sitting down, a lot of us have forgotten how to walk properly. Hunching forward at our desk all day really hasn’t been helping us walk better. The way you hold your body is important to walking comfortably and easily. Poor form can result in injury, discomfort, or cause you to tire sooner than you should. Walking with good posture is efficient, economical and easier on the body. When you walk with proper form, you’ll be able to breathe easier and avoid back pain. Use this top-to-toe guide on walking form to ensure you walk properly. 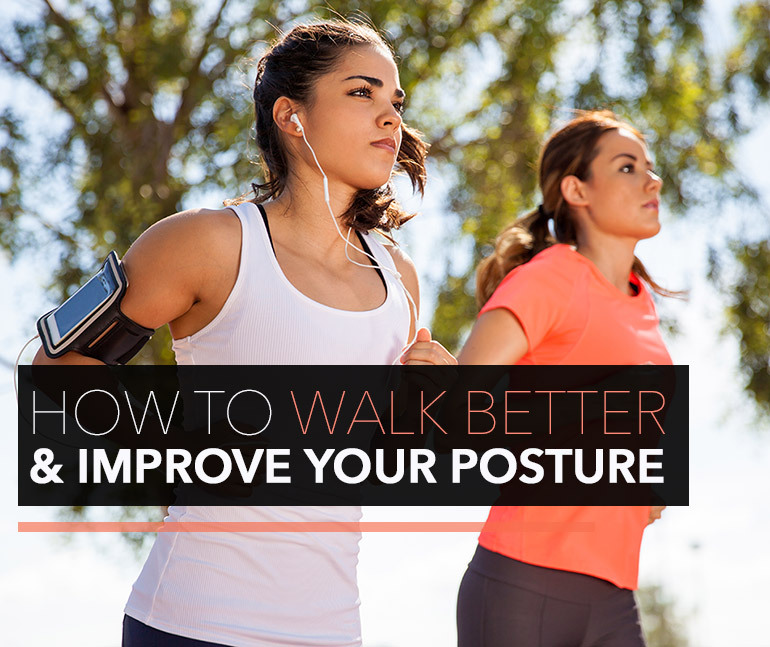 The best way to instantly get better posture is to “walk tall”. This will immediately correct a miscellany of posture issues. Do not arch your back and lean neither forward or back. Stand tall and straight! Wherever your head goes, your body will follow. Ideally, your ears should be directly over your shoulders, your neck should be long, your chin tucked in and you should be looking directly forward. Imagine there is a balloon attached to the crown of your head and it is holding your head aloft. Your head should “float” lightly on top of your neck. As soon as your head drops, the rest of your body will begin to fall forward and out of good alignment. Focus on your head, and the rest of your body will fall into line! Keep your jaw relaxed. No clenching! Good posture is relaxed. Tighten up and your body end up in knots. No looking down! Your eyes should be looking forward, about 20 feet ahead. Keep your chin up – parallel to the ground. Walking with your chin up reduces strain on neck and back. If you are stressed, your shoulders will be tight and raised. This tension then radiates into your neck and arms, and before you know it you’re clenching your jaw and fists and feeling even more stressed than before you started walking. When you walk, focus on gently pulling your shoulders down and back by lifting your chest. By observing the correct head alignment and lifting your chest, you should feel taller than normal. Tip! Shrug once and let your shoulders fall back down and relax, with your shoulders pulled slightly back. Use your actively arms when you walk to generate extra momentum. Your arms aid walking more than you might think. Try walking with your arms held tightly by your sides. You’ll probably feel unbalanced and lack power in your strides. Swinging your arms not only aids walking, but it also increases calorie burn. Keep your elbows bent at about 90 degrees and swing your arms naturally backward and forward. Your opposite arm and leg should be swinging forward together. Your legs should be doing most of the work, your arms are simply helping. So, don’t swing so vigorously that your arms are swinging from side to side and up to your head (it’ll only make you look crazy). It’s okay to let your arms swing slightly across your body if that is where they naturally want to go. But don’t let your hands swing so far that it crosses the center point of your body. Also refrain from swinging your hands too high, they shouldn’t reach higher than your breastbone. If you find that actively using your arms to walk tires you out quickly, do it for 5 – 10 minutes, let your arms rest, and repeat. Keep your hands relaxed. Don’t clench your fists. Instead keep your hands open or lightly close your hands and rest your thumb on top of your first finger. Clenching your fists will cause tension to radiate up your arms and into your shoulders and neck. Clenching your fists can also increase blood pressure. Tip! To help keep your hands relaxed imagine you are holding a fragile egg. As you get tired or work hard to stride up a hill, your hands may start to clench. Be aware of your body and remember the egg! Your core is the muscle group that surrounds your midsection like a wide belt. These muscles provide essential stability to your spine and should be activated while you walk. To activate or brace your core muscles, imagine tightening your stomach muscles in response to someone poking you in the stomach with their finger. As you walk, your core should be braced like this. You may forget to brace your core from time to time – don’t worry, just reset your core whenever you think of it. Tip! One way to remind yourself to brace is to tie a piece of string around your waist at bellybutton level. Whenever you relax your core, your stomach will push out against the string and remind you to tighten up again. In time, bracing will become innate. Avoid overstriding. This can cause pain and injury, and doesn’t help you to walk faster efficiently. Your stride should be longer behind your body, not in front. Your forward leg essentially has no power. It is the back leg that is propelling you forward. You get your power when you push off with your back leg. Your hips should stay fairly level as you walk and there should be minimal hip rolling. Excessive hip movement suggests that there is core or hip instability and that a lot of otherwise useful energy is being wasted. If your hips are properly set, your legs should comfortably swing beneath you as you stride out. Keep your knees lightly bent. Your knees absorb shock as you land and then, like expanding springs, drive you forward into your next step. Make sure your knees do not roll in or out as you walk but, instead, remain properly aligned with your hips and feet. Your feet are the final part of the walking chain. When you’re walking your steps should have a rolling motion. Your foot should hit the floor heel-first with your toes pulled up at an angle of around 45-degrees and your weight slightly behind your foot. Then roll through the step from heel to toe. Push off with your big toe and move into your next step. If you’ve been inactive for some time, your shin muscles may tire easily and get sore. This will resolve as your shin muscles grow stronger with exercise. To check that your feet are working as they should, look at the wear pattern on your shoes. Wear on the outside or inside of your heel or other parts of your shoe suggest that you may be walking incorrectly. If you are concerned that your footfalls are not as they should be, take your worn shoes to a podiatrist who, after a gait assessment, may prescribe you orthotics – a special sort of shoe insert designed to correct faulty footfalls. Wear flexible shoes, as this will allow you to roll through the step. Shoes that are too stiff will cause your feet to slap down rather than to roll through the step. Being aware of your walking technique can help make your workouts more comfortable and enjoyable. Don’t expect to master all of the points above in one walk. Instead, focus on one or two points per walk and gradually build your form from the top down. After a few short weeks, it will become second nature and you’ll have great walking form without having to think about it.